This paper empathize the importance to follow every single step in the surgical procedure even if the surgeon is an expert surgeon. Furthermore, the modern surgical instruments are made to avoid the use of the strength during the procedure, so the use of the hammer during procedure must be discourage and could be harmful. Case Report | Volume 5 | Issue 3 | JOCR July-Sep 2015 | Page 25-28 | G. Zarattini, L. Breda, M. Zacharia, F. Sibona. DOI: 10.13107/jocr.2250-0685.299. Authors: G. Zarattini, L. Breda, M. Zacharia, F. Sibona. Orthopaedic Clinic, University of Brescia, Brescia..
Dr. Zarattini Guido, Department Clinic, University of Brescia, Piazzale Spedali Civili 1, 25123, Brescia. Introduction: Hip fractures, which are common among old patients, are classified into two groups: intracapsular and extracapsular fractures. Extracapsular fractures can be treated with extramedullary implants [e.g. 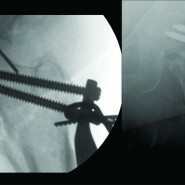 dynamic hip screw (DHS)] or intramedullary nails. Dynamic hip screw is the treatment of choice in stable pertrochanteric fractures. Intrapelvic migration of the sliding screw is a very rare complication. Case Report: We report a case of a 90-year old Caucasian woman who had an unusual intraoperative complication during osteosynthesis procedure for extracapsular hip fracture fixation. In fact, the sliding hip screw went deep into the pelvis during surgery. This mishap required an abdominal surgical approach by the general surgeon to remove the screw. Conclusion: Taking into consideration the poor quality of the bone in very old patients, we emphasize the importance of following every single step of the surgical procedure, in order to minimize the risk of this complication. Keywords: Dynamic hip screw; intraoperative complication in hip fractures; intrapelvic migration of the screw. Hip fractures, which are common among old patients, are classified into two groups: intracapsular fractures and extracapsular fractures . Extracapsular fractures are usually treated with two different procedures: DHS and intramedullary nails. DHS is the treatment of choice in stable pertrochanteric fractures [2,3]. Generally, the positioning of DHS is considered a simple procedure and it is widely used. 5. Fixing the DHS to the femur diaphysis with the necessary screws. Several perioperative complications have been described in medical literature. However, only two case reports described cephalic screw migration into the pelvis during surgical procedure [4,5]. Moreover, few articles report intrapelvic migration of the cephalic screw in the postoperative period [6-13]. Here we present a rare complication which occurred during the fourth step of the DHS technique and led to intrapelvic migration of the cephalic screw. Therefore we review the whole procedure to unravel the possible causes. We report the case of a 90- year old female who was admitted to our traumatology department to fix an extracapsular hip fracture of the left femur which occurred during a low-energy trauma. The history of the patient revealed that she suffered from osteoporosis. In her eighties, she had been conservatively treated with a cast for a right wrist fracture. Previously the patient had been treated for four vertebral compression fractures with thoraco-lumbar orthosis. Spine and femur DEXA scan measurements at the time of the vertebral fractures showed T-Score of -4.9 and -3.7, respectively, confirming a severe osteoporosis. After routine clinical tests, the surgeon chose DHS to treat the pertrochanteric fracture. The operation was performed under general anesthesia, with the patient positioned on a fracture table. The fracture was manually reduced under image intensifier control. Thereafter the surgeon began placing two k-wires into the femoral head through the femoral neck with a lateral skin incision. A complication occurred in this step, as the surgeon found out that the first k-wire had been broken. A second K-wire was positioned. Next the cephalic screw was positioned in the middle of the femoral neck using K-wire to guide the insertion of the dynamic screw. Due to the severe osteoporosis, the surgeon decided to ream only the lateral cortex of the femur to boost the grip strength. The ensuing step was to slide the lateral plate to the cephalic screw until the internal side of the plate was seated on the lateral cortex of the femur. Owing to difficulties in placing the plate, the surgeon decided to use the mallet. During X-ray control of this surgical step, the cephalic screw appeared to have unexpectedly migrated into the pelvis (Fig 1). Several attempts with different surgical forceps were made to remove it through the screw hole, but the screw had penetrated deeply into the pelvis making it impossible to retrieve it. The general surgeon was called to perform an abdominal approach to remove the screw, which was finally retrieved in a few minutes without any further complications. Meanwhile, the procedure of osteosynthesis was completed using a condylar plate (Fig 3). The patient started postoperative physical reconditioning three days after, with only one day’s delay compared to standard procedure. Proximal femoral fractures are very common fractures treated in the traumatology department. The treatment of stable pertrochanteric fractures with DHS is the preferred procedure although medical literature reports numerous complications. The main intraoperative complications during the insertion of DHS include malassembly ; tearing and migration of the guide wire into the pelvis ; migration of the compression screw ; intrapelvic vascular injury caused by the guide wire . Few cases of postoperative intrapelvic migration of a lag screw are reported [10-14]. In 2007, Naido Maripuri et al., reported the first case of intraoperative intrapelvic migration of the sliding hip screw in a 78-year old man . The authors suggest the use of the mallet to fit the plate on the screw as a possible cause of the complication. Secondly, the authors explain that, in such a case, the premature removal of the lag screw extender did not thwart the migration of the screw. A third cause of the complication was probably the over-reaming of the femoral neck and head before engaging the plate on the screw. In this patient, the surgeon successfully removed the screw from the hole in the bone with a biopsy forceps avoiding an abdominal approach. Nevertheless, the patient died for perioperative complications three weeks later. More recently, Singh et al., reported a second case of intrapelvic migration of a hip screw in a 55-year old man . Like in the case reported above, the surgeon did not use a lag screw extender but hammered the plate over the screw. This resulted in sliding of the screw into the pelvis. The authors assume that the over-reaming of the proximal femur could be the reason for the complication. In this case too, the surgeon removed the screw through the hole in the neck with a Kocher’s forceps without any complications. After this uncommon but undesirable complication, we analyzed every possible cause of the procedural flaw with our patient. First, we evaluated if we had followed the surgical techniques reported in the DHS manual correctly. The orthopedic surgeon who performed the operation was a senior surgeon of proven experience who had treated several femoral fractures with DHS in his career. Taking such facility and experience for granted, some steps must be scrutinized and some kit-device must be spared. 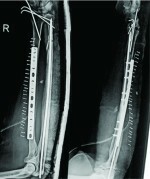 In this case, the surgeon did not use all the instruments presented in the basket of the DHS implant, which included a lag screw extender (Fig 2). This instrument is a threaded rod which fixes the head screw during the plate sliding procedure. In our opinion, failing to use a lag screw extender is the principal cause of this complication, both in our case and in the other ones reported in medical literature. Moreover, a close examination of the instructions for using DHS devices coming from different companies revealed that this significant step is unexpectedly omitted. On analyzing the whole surgical procedure of our case in detail, we also noticed that a second cause could be an incorrect alignment between the octagonal hole of the plate and the octagonal shape of the screw. This incongruence may originate several multidirectional forces in the threaded part of the screw while using the mallet, resulting in a relocation of the screw across the pelvic bone (Fig 2). Finally, we think that the poor quality of the bone engendered by osteoporosis is a high- risk factor for pelvic bone damage caused by a cephalic screw, which can easily penetrate into the pelvis. Indeed, especially on using the mallet, the surgeon could not perceive the bone resistance of the acetabular notch. In our case, unlike the other two clinical reports, the screw was removed by the abdominal surgeon with extraperitoneal approach, a safe, easy and fast procedure which lets the screw out without damaging internal organs. On the contrary, removing the screw from the hole of entry does not ensure that bowels will not be damaged. In fact, this approach makes it impossible to see the threaded part of the screw, which could pull out some soft tissue during the removal. We also wish to emphasize the jeopardy involved in tapping with the mallet when the plate does not slide on the cephalic screw. On the contrary, this step requires performing gentle manual movements, in order to find a geometrical congruence between plate and screw (Fig 2). Furthermore, it is important to use a lag screw extender without removing it until the plate is fixed to the lateral cortex of the femur and the image intensifier confirms its right position. Indeed, we are convinced that this is the main measure to avoid this complication. Suffice it to say that a lag screw extender was not used in our case, nor in the one reported by Singh , while in the case contributed by Naido Maripuri  the lag screw extender was removed earlier than required. In this case, the cause of the problem cannot be ascribed to the over-reaming of the bone as reported in the other two cases, inasmuch as the surgeon did not ream the neck of the femur but only the lateral cortex to increase the grip between screw and bone. On the other hand, severe osteoporosis contributed to the pelvic migration of the screw, especially on using the mallet. In the only two cases regarding intrapelvic migration reported in medical literature, the patients were not suffering from osteoporosis. Our case report underlines the importance of scrupulously following the steps of DHS surgical technique, particularly in the application of a lag screw extender. As a matter of fact, the use of the mallet to slide the plate on the screw should be discouraged. If the plate and the screw are not on the same plane, it is recommended to manually control the rotation of the plate until they are congruent. This should be made mandatory, especially when treating very old osteoporotic patients. Finally, in the event of such an unfortunate complication, we would suggest resorting to an extraperitoneal approach to remove the intrapelvic screw, a far safer and faster procedure. Intrapelvic migration of a hip screw is a rare complication. Awareness of such potential event and scrupulous adherence to the DHS surgical technique, especially when treating very old osteoporotic patients, can avoid this complication. Following the steps of DHS surgical technique is mandatory, even for expert surgeons, particularly in the application of a lag screw extender, in order to avoid intrapelvic screw migration. In case of such complication, extraperitoneal approach to remove the intrapelvic screw is a fast and safe procedure. 1. Parker M, Johansen A. Hip fracture. BMJ 2006. Jul 1;333(7557):27-30. 2. Butler M, Forte M, Kane RL, Joglekar S, Duval SJ, Swiontkowski M, Wilt T. Treatment of common hip fractures. Evid Rep Technol Assess (Full Rep) 2009. Aug;(184):1-85, v. Review. 3. Leung F, Gudushauri P, Yuen G, Lau TW, Fang C, Chow SP. Dynamic hip screw blade fixation for intertrochanteric hip fractures. J Orthop Surg (Hong Kong). 2012 Dec;20(3):302-6. 4. 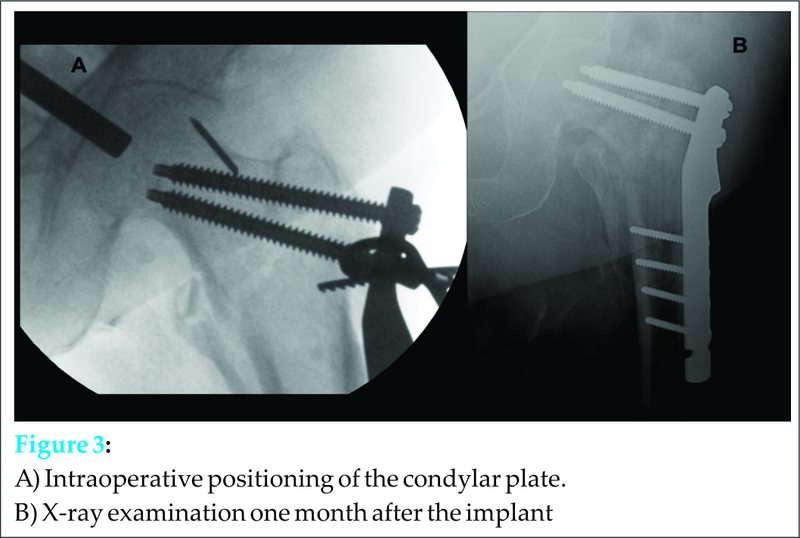 Naidu Maripuri S, Debnath UK, Hemmadi S, Wilson C. Sliding hip screw in pelvis: a rare intraoperative complication. Arch Orthop Trauma Surg. 2007. Sep;127(7):523-5. 5. Singh R, Rohillai RK, Siwach R, Singh Z, Magu NK, Sangwan SS. Intraoperative migration of dynamic hip screw into the pelvis. J Coll Physicians Surg Pak. 2010 May;20(5):341-2. 10. Bhatti A, Abbasi A. Intrapelvic total migration of sliding screw in intertrochanteric fracture. J Coll Physicians Surg Pak. 2007. Jun;17(6):371-3. 13. Rao SB, Pringle RG. Intrapelvic penetration of a sliding screw: a rare complication. Injury. 1992. 23(1):56-66. 14. Rokito AS, Koval KJ, Zuckerman JD. Technical pitfalls in the use of the sliding hip screw for fixation of intertrochanteric hip fractures. Contemp Orthop. 1993. Apr;26(4):349-56.